This study aims to examine the effect of service quality on satisfaction and its impact on the restaurant's ability to build customer loyalty. The sampling method used was accidental sampling. The analysis technique used was SEM PLS. The results showed that the quality of service had an impact on satisfaction which led to an increase in restaurant customer loyalty. Managerial implications of research results should be that managers or restaurant owners could improve service quality through reliability, responsiveness, assurance, empathy, tangible so that customer satisfaction increases so that it had an impact on customer loyalty. Aldaihani, F. M. F., & Ali, N. A. b. (2018). Factors Affecting Customer Loyalty in the Restaurant Service Industry in Kuwait City, Kuwait. 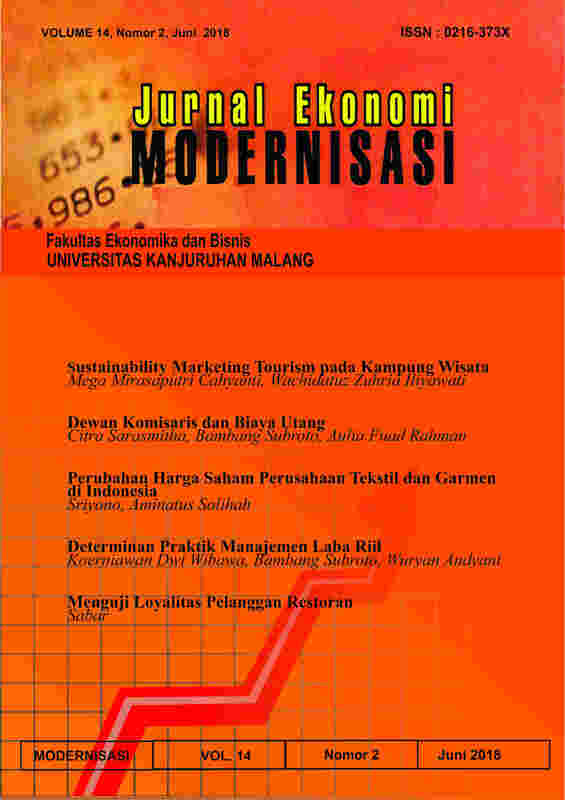 Journal of International Business and Management, 1(2), 1-14. Alonso, A. D., & Krajsic, V. (2014). Cost management and small restaurant businesses: a complex balance and the role of management. International Journal of Revenue Management, 8(1), 1-19. Heung, V. C. S., & Ngai, E. W. T. (2008). The Mediating Effects of Perceived Value and Customer Satisfaction on Customer Loyalty in the Chinese Restaurant Setting. Journal of Quality Assurance in Hospitality & Tourism, 9(2), 85-107. Jin, N., Line, N. D., & Merkebu, J. (2015). The Impact of Brand Prestige on Trust, Perceived Risk, Satisfaction, and Loyalty in Upscale Restaurants. Journal of Hospitality Marketing & Management, 25(5), 523-546. Kim, W. G., Lee, Y.-K., & Yoo, Y.-J. (2016). Predictors of Relationship Quality and Relationship Outcomes in Luxury Restaurants. Journal of Hospitality & Tourism Research, 30(2), 143-169. Kotler, P. (2010). Manajemen Pemasaran (Tiga Belas ed.). Jakarta: Erlangga. Ladhari, R., Brun, I., & Morales, M. (2008). Determinants of dining satisfaction and post-dining behavioral intentions. International Journal of Hospitality Management, 27(4), 563-573. Mun, S. G., & Jang, S. (2018). Restaurant operating expenses and their effects on profitability enhancement. International Journal of Hospitality Management, 71, 68-76. Pan, Y., Sheng, S., & Xie, F. T. (2012). Antecedents of customer loyalty: An empirical synthesis and reexamination. Journal of Retailing and Consumer Services, 19(1), 150-158. Powers, T., & Barrows, C. W. (2003). Introduction to management in the hospitality Industry. New York: John Wiley & Sons. Russell-Bennett, R., McColl-Kennedy, J. R., & Coote, L. V. (2007). Involvement, satisfaction, and brand loyalty in a small business services setting. Journal of Business Research, 60(12), 1253-1260. Ryding, D. (2010). The impact of new technologies on customer satisfaction and business to business customer relationships: Evidence from the soft drinks industry. Journal of Retailing and Consumer Services, 17(3), 224-228. Ryu, K., Lee, H. R., & Gon, K. W. (2012). The influence of the quality of the physical environment, food, and service on restaurant image, customer perceived value, customer satisfaction, and behavioral intentions. International Journal of Contemporary Hospitality Management, 24(2), 200-223. Susanti, C. E. (2013). The Effect of Product Quality and Service Quality Towards Customer Satisfaction and Customer Loyalty in Traditional Restaurants in East Java. Paper presented at the Proceedings of the International Conference on Managing the Asian Century, Singapore. Tsai, M.-T., Tsai, C.-L., & Chang, H.-C. (2010). The Effect of Customer Value, Customer Satisfaction, and Switching Costs on Customer Loyalty: An Empirical Study of Hypermarkets in Taiwan. Social Behavior and Personality: an international journal, 38(6), 729-740. Vad Andersen, B., & Hyldig, G. (2015). Food satisfaction: Integrating feelings before, during and after food intake. Food Quality and Preference, 43, 126-134. Yuksel, A., & Yuksel, F. (2002). Measurement of tourist satisfaction with restaurant services: A segment-based approach. Journal of Vacation Marketing, 9(1), 52-68. Zeithaml, V. A., & Bitner, M. J. (2003). Service Marketing. New Delhi: Tata McGraw Hill.